There are 2 computer labs available to Medical Students in the Medical Science Building. The medical school computer lab/training room is located in Room A-555. This room is equiped with 15 work stations and 1 printer. It is accessible 24×7. Any questions or issues regarding this lab can be addressed to njmsts@njms.rutgers.edu or stop by the IT@NJMS office (A-550) directly across the hall from the computer lab. You can also pick up paper for the printer from the IT@NJMS office. The university computer lab is located on C-Level across from the escalators. Regular printing as well as poster printing is available. Printers are available in the 2 Computer Labs above as well as in the Library. All locations use the PaperCut print quota management system. In addition, there are about 40-workstation computers in the George Smith Library. 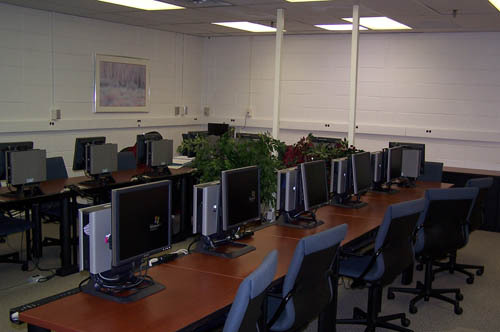 The NJMS Computer Lab, located on A-555, doubles as a training facility. It is equipped with 15 computers. You can request a portable projector. To book the room for a training or testing session, please contact njmsts@njms.rutgers.edu. Additional training room and testing facilities are available in the university computer lab on MSB C level (20 computers) and in the George Smith Library (one 15 computer lab and one 15 laptop lab).